"Despite Oliver Stone's preference for delivering blunt messages with a jackhammer, bits of ambivalence occasionally seep through and enrich his discourses. 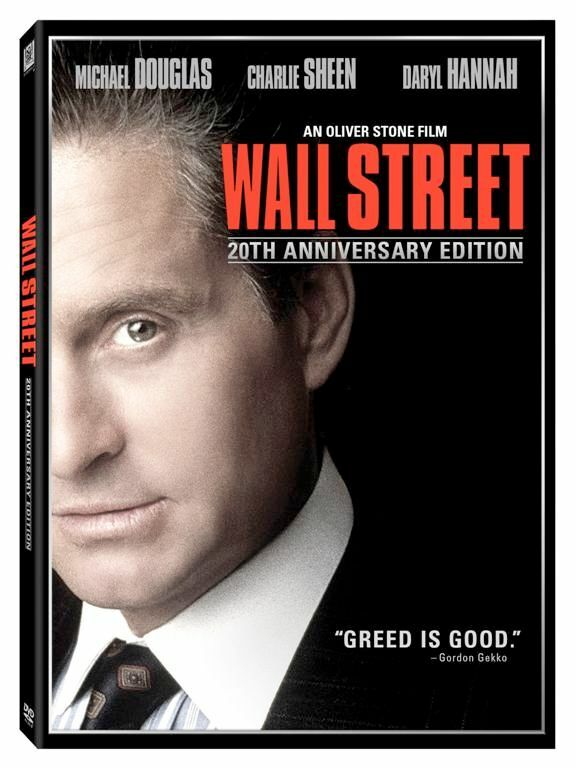 From his venomous putdowns to the reptilian blatancy of his surname, Gordon Gekko (Michael Douglas), the soulless corporate pasha at the center of Wall Street, is the picture's designated villain, yet somehow manages to emerge as something more intricate than Mephistopheles in a stripped shirt and suspenders. As with Tony Montana in the Stone-scripted Scarface, Gekko's appeal derives both from the charisma of the actor playing him (Douglas netted a Best Actor Oscar) and from the kind of implacable drive that still makes him a role model in the eyes of many an aspiring business shark. This ruthless riding of corporate America's buccaneer mentality is what keeps the "greed is good" speech from sliding into a facile punchline; when Douglas's Gekko heralds rampant capitalism as "the essence of the evolutionary spirit," it's in the chillingly seductive voice of someone who's learned to survive and prosper in a degraded system. Unfortunately, this blend of indignation and admiration is a solitary instance of complexity in a work that is much more comfortable pounding its pulpit over easily definable, melodramatic opposites. Wall Street's narrative about the corruption of avid young broker Bud Fox (Charlie Sheen) as he enters the world of big-time investment banking is transparently a transposition of the dynamics of Stone's Platoon, with the jungle battleground turned to concrete and surplus male aggression measured by the size of wallets rather than guns. Even the earlier picture's bad father/good father schism is revisited as the juvenile oscillates between Gekko's silky tutelage and the blue-collar decency of his real father (Martin Sheen), but because Bud is less a man open to corruptible urges than a mannequin pushed from one side to the other to illustrate the movie's points, there's little sting to his quandaries. Never less than dynamic, Stone's combustible camera rolls with the characters' turmoil, while the punchy supporting performances in the large cast and Stone's handling of volcanic stockbroker-pit energy reveal a surprising debt to Frank Capra. Or maybe not so surprising; for all its hopped-up, Chayefskyian fury, Stone's attack on the excesses of the Me Decade could easily be dubbed Mr. Smith Goes to Wall Street. The transfer in the 20th anniversary DVD edition is, in one word, plangent. The image is vivid, displaying the potent tones and sweep of Robert Richardson's cinematography, while the sound quality strongly showcases the director's complex aural choices as well as the cast's shouting range. Stone explains his personal fondness for Wall Street (which is dedicated to his father Lou, a stockbroker) in his intro and in his exceptionally intelligent audio commentary, fully stocked with info from filmmaking details to character motivation. No less rewarding are two in-depth documentaries on the picture's production and legacy, "Greed Is Good" and "Money Never Sleeps," in which real-life Wall Street dwellers second its verity (excepting, of course, its "fantasy" denouement) and Stone and cast members offer some cogent insights into the material (Douglas nails it when he links Gekko to a "movie star"). A reel of deleted scenes (and a few bloopers) is also featured. Greed may be good, but this anniversary edition of Oliver Stone's humorless '80s satire is exceedingly generous with extras."